Paper Mario Color Splash; New Footage! It’s probably not going to change your mind about this title. But still, do you know what it has shown me? How much potential Paper Mario Color Splash could have to become a great game. Cause let’s face it, there are some aspects of the game that are really well done here. Like the music. The soundtrack in that haunted hotel was fantastic. It really made you feel like you were in a hell hotel. Somewhere in… The Twilight Zone. And the general presentation was really good too. The paper Toad ghosts look pretty cool with their blue half transparent appearance. The run down building has a great atmosphere to it. The flying books and furniture looked really good. In a normal Paper Mario game, this would be an amazing area. It’s just that then you get to the boring content. The generic Toads as the only characters. The generic Mario enemies as the only enemies. The Red Paratroopa taking the place of an actual bird. The jarringly random Things like the dancing pig. It’s such a shame. All these good ideas, then they’re all wasted on a generic game with no charm or personality to most of it. You can see all these hints of a truly creative game that’s just dying to come out, but everything’s buried under Sticker Star esque crap. As for the Things… well, it seems like another attempt by Nintendo to get with the ‘youth’ audience. Because where else do we see such obvious examples of being ‘weird’ for the sake of ‘weird’? Above: All this now in Thing form! The other concepts in the game are just boring and uninspired. Things on the other hand are lowest common denominator insanity. They’re the kind of things some social media intern thought up to appeal to Snapchat users. 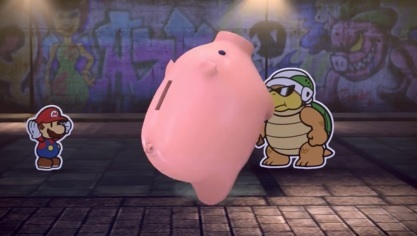 That dancing pig… it’s like something you’d see on the Fellow Kids subreddit. It’s like something an old grey haired suit would create to ‘appeal to 12 year olds’. It’s kind of embarrassing really. Put simply, it looks kind of dreadful. Sure, it’s not broken. You’re not flying through walls like Big Rigs or Superman 64. Heck, engine wise, it seems to be pretty solid in general. But you don’t seem to do anything interesting here. The battles are still mostly pointless, the hotel itself seems to have very few enemies (two normal ones and a boss) and the main gameplay is just wandering around and talking to people. Well, that and using your hammer to colour things in. An action with all of three choices for a given scenario. And that’s the problem with Paper Mario Color Splash in general. It’s a very nice looking coat of pain over gameplay that’s paper thin. By removing things like paper abilities, partners and pixls, the developers have basically reduced the series to a walk and sometimes jump simulator. 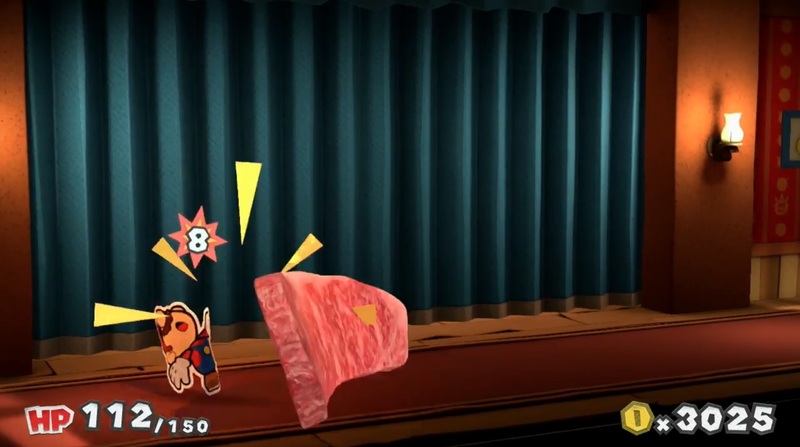 These aspects were the basis of the game’s puzzles and general difficulty outside of battle. By removing them, the non battle aspect of this game has basically become utterly trivial. So all in all, Paper Mario Color Splash still seems to be a wasted opportunity for a game. It’s got a nice art design and soundtrack, but that’s just buried under some boring, generic content and core gameplay that just doesn’t seem very interesting. There’s still some hope for this game left, but I’m not counting on it. Pretending it's not Paper Mario, it doesn't look that bad. Is it different? Yeah. Is it like Sticker Star? Yeah. Is that a bad thing? Yes and no. Sticker Star bombed because people were expecting it to be like the other games, but it wasn't. Going in to this knowing it's different, might be another story. 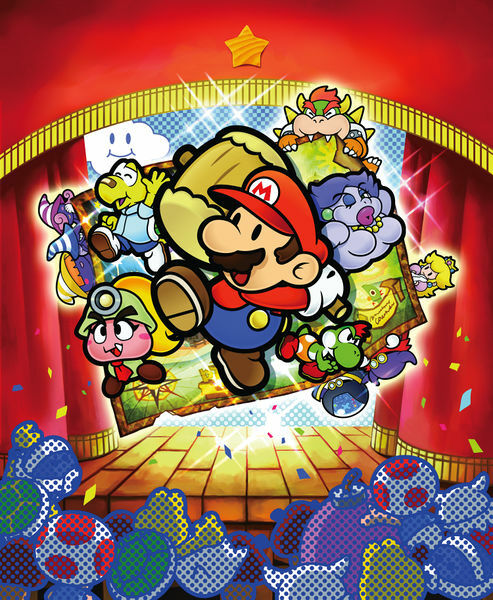 Who knows, now that we know it's going to be different than traditional Paper Mario games, maybe it won't be so bad. However, that doesn't mean it's going to be good either. Paper Mario Color Splash; New Trailer and Footage!